There can be few stranger settings for a medieval church than this, for the small graveyard of St Mary is surrounded on three sides by the Thrigby Wildlife Gardens. The first time I ever came here was late on an early Spring afternoon in 2004; in many a country graveyard, you might expect to hear a blackbird piping, or perhaps the last thrush of the day, but here the graveyard was full of the sounds of Indian cranes, scolding me for standing with my back to their enclosure. Coming back on a beautiful day in 2011 it was the whoop of monkeys which greeted me. Back in 2004 I had found the church in a very bad condition, propped up and locked against all-comers, but much has happened here in the years since, and Thrigby church is now a well-cared for and obviousy much-loved building. What's more, the door was not only unlocked, it was propped open. The little headstop which I had found sinister back in 2004 now seemed a kinder, gentler fellow as he grinned at me. The strangeness of St Mary's setting outweighs the surprise of anything you might find inside, but in fact this is rather a curious church. What is basically a building of the 14th Century received an eccentric restoration in the 1890s, when the windows were reset with wooden tracery, and the chancel arch rebuilt in yellow brick. If you look high above the arch you'll see what appear to be Saxon reliefs, presumably found and reset there by the late Victorian restorers. A grand 1826 monument by Blyth & Watson on the north wall remembers Robert Woolmer, who died at the age of 97 in 1807. It tells us that he was patron of this church, and goes on to list further that he was a good benefactor to the widow and fatherless children, a true, sincere and well known friend to the country. The monument was erected by Thomas Browne some twenty years after Woolmer's death. The brass strip beneath it records that the 1890s restoration was paid for by Thomas Daniel of Thrigby Hall. A ledger stone in the chancel floor remembers a Thrigby rector of a century earlier who was the friend of mankind, a faithful preacher of the Gospel and steadily practiced the divine precepts he taught. He was released from a long and painful illness at the age of 86 in 1791. Several medieval consecration crosses were revealed by the restoration, but apart from that this is entirely an interior of the 1890s, without any of the High Gothic verve which often informs that decade. It is a simple, undemonstrative church of no particular significance. Hardly anybody lives in Thrigby, and those that do are mostly closer to Filby church. On an earlier version of this page, after I had found the church approaching dereliction in 2004, I pondered its future. Observing that the building was not significant enough for the Churches Conservation Trust to take it on, I wondered if perhaps the best solution would be to hand it over to the wildlife gardens and let them fill it with monkeys or something, which would at least be entertaining. I'm glad that they didn't. For, if Thrigby church is just an ordinary, run-of-the-mill rural parish church, it is all the more important for that fact. 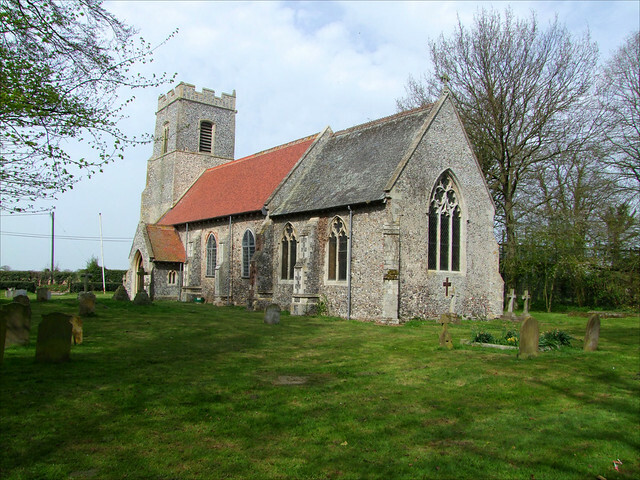 John Betjeman once observed that every single Norfolk church was a pearl in a vast necklace, and to lose even one of them is to ruin the necklace. St Mary's is a church to be celebrated, all the more so for being so ordinary in such an extraordinary setting. That it has retained a feel of its rural near-past is also good thing, for it remains an oasis of peace in a busy world, and a blessing to those who visit the gardens, and might come in here as well.